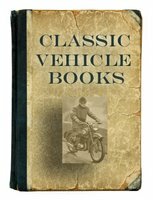 This selection of classic New Zealand bike books covers the history and development of the New Zealand motorcycle industry and noted New Zealand riders. Vintage Motor Cycling by Maureen Bull (1970). A Record of Motor Cycling in New Zealand from 1899 to 1931. This is a terrific book on the vintage scene as it happened in New Zealand. The intrepid riders were every bit as enthusiastic and gifted in their riding and solving the numerous problems encountered as their British counterparts, perhaps more so, in that there were less people to ask and the manufacturer's were mostly from the other side of the globe. Nonetheless, competition was fierce in all classes of the sport and some great riders developed and some superb home built specials challenged the big names. The book tells the story and also gives the results, bike specs, riders and much more in the greatest detail. Great Escapes: A Guide To Motorcycle Touring In New Zealand by Peter Mitchell (2000). This excellent guide to over 40 great escape runs, in both the North and South Island, explores endless terrains of open country, spectacular coastlines and hidden roads of promise. Each run is accompanied by a map, a route description giving times and distances, and an overview of the added attractions and highlights encountered along the way. New Zealand Motorcycle Atlas by Peter Mitchell (2005). The definitive book for both NZ motorcyclists and tourists. As well as maps, it lists the 100 best rides in NZ - photos, road conditions, things to see, grin factor rating - everything you want and more besides. Classic Motorcycles In New Zealand by Kerry Swanson (1997) examines the evolution of the do-it-yourself attitude amongst Kiwi motorcyclists by focusing on individuals and their machines.